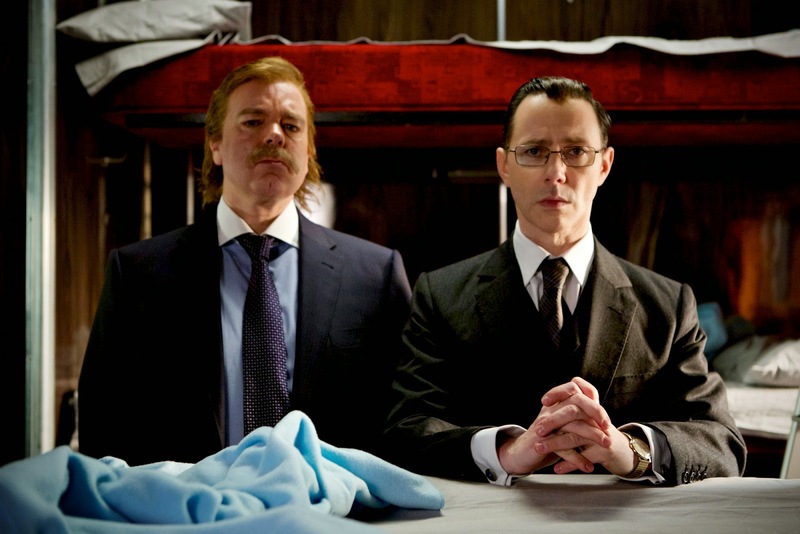 The Custard TV: Inside No.9: Was the first episode worth the wait? Inside No.9: Was the first episode worth the wait? If Hitchcock was the Master of Suspense, and Poe the Master of the Macabre, then (ex) The League of Gentleman’s Reece Shearsmith and Steve Pemberton are surely the Masters of Claustrophobia. Following 2014’s triumphant first series, Inside No. 9 returns to our screens with six more perfectly formed, queasy half hours, each one set in a single location (the No.9 of the title). Tonight’s opener, ‘La Couchette’, was set entirely inside a sleeper train cabin as it wended its way across France, and was chokingly confining. Though a larger space than the cupboard of ‘Sardines’ (series one’s opener), we never had the relief of panning out occasionally to a larger room. We didn’t even see the corridor. Anyone who’s ever sampled the delights of sharing a sleeper train with half a dozen strangers would have found this episode grimly reminiscent (though chances are you didn’t find a corpse). ‘This isn’t Murder on the Orient Express’ said one. No, this was ‘Intrigue on the Intercités de Nuit'. Pemberton and Shearsmith, as ever, playing merry hell with the genres. Crammed inside our sleeper cabin, banging their heads on the ceiling and breathing in each other’s farts, were a faffing middle aged couple, Kath and Les (Julie Hesmondhalgh and Mark Benton), a foul-mouthed Aussie backpacker (Jessica Gunning), a posho young English twit (played by – you’ll never guess – Jack Whitehall), and Shearsmith and Pemberton playing versions of the stock characters we’ve seen them inhabit countless times before (Shearsmith the uptight, clean-shaven prig, Pemberton the hairy, sweaty oaf). This is not a criticism – one of the duos great strengths is the cupboard of weirdos that they inhabit so well. When they repeat character traits it feels like someone drawing upon a repertoire, as opposed to scraping the barrel. Ultimately, and no surprises here, the corpse was no coincidence and foul play was, of course, afoot. Not many shows can carry off Inside No. 9’s cocktail of heart-in-mouth drama (and occasionally spine-tingling terror) and comedy with such panache. Perhaps none since The League of Gentleman itself. However, a concern is that after series one the audience will have grown wise to the tricks – certainly the twist in this episode’s tail could be spotted a long way off. However, Shearsmith and Pemberton always have one eye on the audience and the only expectation to be expected is that this will be another cracking series.